Climbing to altitude heights over 8,000 feet results in significantly lower Oxygen levels making it difficult for the human body to adjust. 40% of people who visit high-altitude/low oxygen tourist attractions (like the Swiss Alps) can experience ranges of Mountain Sickness (headaches, nausea, and general malaise). According to WEB MD, National Health Service (UK), eMedicineHealth (and other reputable sources), giving supplemental Oxygen is the #1 recommended remedy for the symptoms of altitude sickness caused by the deprivation of oxygen to the body. BOOST Oxygen has been used by countless alpine and mountain enthusiasts to help recover from the effects associated with altitude sickness (Acute Mountain Sickness). Air pollution both outdoor and indoor is a major environmental risk to health. Exposure to air pollution is accompanied by an increased production of free radicals (unstable molecules with an unpaired electron), which lead to cell damage. Oxygen is used to stabilise these free radicals. While we cannot completely control the changing world and its decreasing air quality, we can take steps to help ourselves feel better. 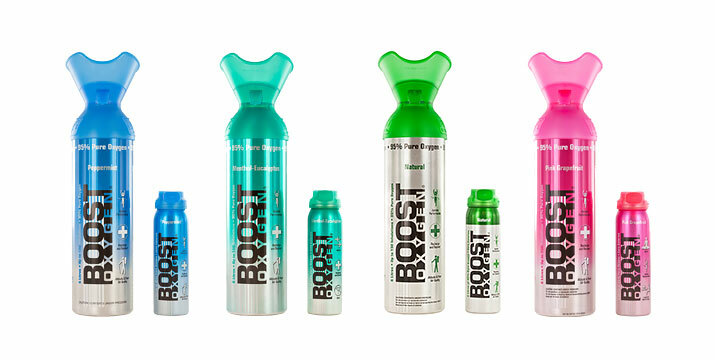 Users can rely on BOOST Oxygen to breathe when Oxygen levels are poor due to pollution or diminished air quality. To stop altitude sickness, or recover from it, try Boost Oxygen Natural. Take three-to-five inhalations at the onset of your climb to your high-altitude destination, three-to-five during periodic rest periods, and three-to-five inhalations at the end of your trek. Throughout your climb, repeat inhalations as needed. Should acute mountain sickness symptoms continue or worsen, immediately seek lower elevations and medical assistance.